We’re not sure why anyone would want to skin a cat… that sounds gross and cruel. But the idea is there’s often more than one way to get something done. In this case, we’re talking about wealth re-distribution. We realize that’s a politically charged topic, but anyone who’s rich … or plans to be … should be paying close attention to the winds of change on this hot topic. There’s a big and growing gap between the rich and the poor. Meanwhile, only a small percentage of middle-class are successfully fighting their way into the realm of the rich. Most are falling off the back of the bus into the pit of poverty. We’re not here to point fingers. There’s plenty of blame to go around. But we think it can be credibly argued that the Fed’s decade-long easy-money policy has inflated both asset prices and the cost of living. This worked to the advantage of asset owners, but to the detriment of the paycheck-to-paycheck folks. It’s no surprise they’re mad about it. Of course, there’s no point in ranting about what we think policy makers should or shouldn’t do. They don’t listen to us anyway. So we simply watch and consider how the future might unfold … then get in position to capture opportunity and mitigate risk. You’re probably aware, the USA is ramping up for yet another knock-down drag-out presidential election cycle. In addition to stocking up on popcorn, we’re thinking about which issues will frame the debates. … it seems a major objective is to make rich people do more for the poor … by hook or by crook. There’s the “Robin Hood” approach of taxing the rich and giving benefits to the poor … free college, healthcare, basic income, etc. The Opportunity Zone idea is to provide tax incentives to the rich so they voluntarily move their money into poor areas … thereby creating jobs and commerce for the currently disenfranchised. There’s a lot of history on the crook approach … and it doesn’t have a strong track record of creating abundance. But it’s easily sold to desperate people. Obviously, no one yet knows how the Opportunity Zone “hook” will work out … but the idea seems promising, so we’re watching it closely. … at least Opportunity Zones are a new approach to the problem of getting capital to where it’s needed most. That’s why when we saw Yardi Matrix had released this well-written and informative white paper on Opportunity Zones, it captured our attention. So Opportunity Zone development is already up to over 10% market share nationwide in not one, but THREE real estate niches. And even though many details about the Opportunity Zone program remain unclear …. … BIG money is moving forward NOW and creating a wave of capital small investors can potentially ride to profits of their own. This creates an unprecedented opportunity for Main Street investors. Because while a small investor might have the means to fix up a single derelict property on his own, he can’t really change the local economy all by himself. Sure, a large group of small investors might team up to upgrade a specific neighborhood … changing the personality of the neighborhood and improving everyone’s chance of seeing their value-add stick long-term. … including jobs, and access to services and opportunities for those people who get left out of financial boom times. After all, you can only benefit from asset inflation if you own assets. Most lower-income folks don’t. For them, inflation just means higher living expenses and a higher hill to climb to become an asset owner. But Opportunity Zone incentives entice rich people to move their profits from inflated financial assets into depressed real estate. The best Opportunity Zone perks go to those who stay in their markets for at least TEN years. That’s enough time to light a permanent flame in a local economy. … the workers will have both the incomes and opportunities to purchase affordable properties themselves. Now the worker can get into the asset owner class. And until they do, they have paychecks to pay YOU rent. Of course, as the workers’ labor is partnered with investors’ capital to improve the Opportunity Zone, the asset owning laborers also get to ride the equity wave they’ve helped create. And so do YOU … if you’re in the right position. So we encourage you to read the Yardi Matrix white paper because there’s useful data and insights to help identify specific markets to explore. Opportunity Zones may not yet be a proven model for creating access to prosperity for lower-income folks, but the potential is there. And if YOU aren’t as high up the economic food chain as you’d like to be … consider syndication as a way to get rich helping the rich get richer. When you syndicate, YOU marry your capital and labor to the capital of your wealthy investors … and then marry all that to the BIG money driving the growth in these Opportunity Zones. If you’re an American, unless you’ve been in a coma or living under a rock, you know the United States just had one of the most energetic mid-term elections in quite some time. The day after, both sides are disappointed … and both sides are claiming victory. One of the advantages of being older is we’ve seen this movie before. In our younger days, when elections didn’t go our way, we thought it was the end of the world. Today, not so much. It doesn’t mean we don’t care. We do. And certainly, politicians and their policies have a direct impact on our Main Street investing. But it’s in times like these we’re reminded of the beautiful, boring stability of real estate. Because while all the post-election drama and speculation plays out, people still get up and go to work and pay their rent. And though the Trump-train just got slowed … like Barack Obama before him, big chunks of his agenda got pushed through early … and are likely here to stay for a while. In other words, it doesn’t look like Obamacare or the Trump tax reform will be repealed any time soon. More importantly, investors of all stripes … paper and real … now know what the lay of the land is for the next two years. Early indications (based on the all-green dashboard of Wall Street) reveal there’s cash on the sidelines waiting to see what happened … and now that gridlock is the answer… money is pouring into everything. We know that sounds counter-intuitive. But while political activists push change … too much change too fast makes money nervous. Investors and entrepreneurs need to make decisions about long-term risk and reward. And when the world is changing too fast, those decisions are harder to make. Way back in the lead-up to the 2010 mid-terms, we penned this piece about a concept we call “healthy tension.” Just change the team colors and it’s just as applicable today as it was back then. The point is that money and markets like gridlock. At this point, from an investing perspective, it doesn’t really matter if any of us like or dislike what happened … politically. It’s done. Now we all just need to decide what it means to us and how to move forward … because life goes on. We’re guessing all the great Trump-tax reform benefits for real estate investors… from bonus depreciation to Opportunity Zones … are here to stay. And as we said just a week ago … there’s probably a lot more money headed into real estate. Nothing about this election appears to change that. So gridlock inside the beltway means stability on Main Street. Sure, it might be a little boring. But real estate investors are used to boring. And when it comes to long-term wealth building … boring is good. … big fund managers are pay close attention to a variety of factors for clues about the ebb, flow, and over-flow of people, business, and money. Right now … it seems like a BIG wave of money could be headed into real estate. Of course, compared to stocks, these things aren’t simple to see and track. And they’re even harder to act on. Stocks are easy … if interest rates fall and money floods into stocks, you just buy an index fund and enjoy the ride. Just remember … the dark side of easy and liquid is crowded and volatile. So unless you’re a seasoned trader, trying to front run the crowd to both an entrance and exit in stocks can be a dangerous game. But real estate is slow. It’s inefficient. It moves slowly. There’s drama. And yet, the BEAUTY of real estate is its messiness. Embrace it. We’ll be talking about this more in the future, but the short of it is the new tax code creates HUGE incentives for current profits from ANYTHING (including stocks) to make its way into pre-identified geographic zones. One reason savvy investors watch economic waves is to see a swell building … so they can paddle into position to catch a ride. It’s like financial surfing. Time will tell where all these funds will land, but it’s a safe bet it won’t be in smaller properties. MAYBE some will end up in residential mortgages, but don’t count on it. So what’s the play for a Mom and Pop Main Street investor? We’ll be watching the markets and product types the money goes into. Then we’ll be watching for the ripple effect … because that’s probably where the Main Street opportunity will be. For example, if money pours into a particular geography, it’s going to create a surge of economic activity … especially if the funds are primarily used for construction. But we’d be cautious about making long-term investments in any place temporarily benefiting from a short-term surge … so it’s best to look past the immediate impact. Think about the long-term impact … which is a factor of WHAT is being built. Fortunately, major projects take many months to complete … so they’re easy to see coming IF you’re paying attention. We like to plug into the local chamber of commerce to track who’s coming and going in a market place … and why. The local Business Journal is also a useful news source to monitor. The kinds of development that excite us include factories, office buildings, industrial parks, and distribution centers. Those mean local jobs. We’re less excited about shopping centers, entertainment centers, and even residential and medical projects. Because even though they mean jobs too … they don’t DRIVE the economy. They feed off it. Of course, we’re not saying those things are bad … but they should reflect current and projected growth … not be expected to drive it. Hopefully, developers are doing solid market research and are building because the local population and prosperity can absorb the new product. Then again, when money is aggressively pumped in, sometimes developers get greedy … and areas get OVER-built. So don’t just follow the big money. Be sure you understand the market. Sometimes money moving into a market creates prosperity only for some … and hardship for others. Silicon Valley is a CLASSIC example. As billions flood into the market through inflated stock prices, many people get pushed off the back of the affordability bus. But even though it’s hard for those folks, they end up driven into adjacent markets which are indirectly pushed up. It’s overflow. Sure, in Silicon Valley’s case, the flow of money is cheap capital pouring into the stock market and enriching tech companies … and their employees. But it doesn’t matter which door the money comes in when it flows into a market. That’s why it’s best to look at ALL the flows into a market. And when the flow of capital drives up investment property prices in a market (depressing cap rates), even investors will overflow into secondary markets in search of better yields. The lesson here is to watch the ebb, flow, and overflows as capital pours into both the debt and equity side of real estate through Opportunity Zones, private equity funds, and increasing pension fund allocations. You never quite know how the market will react, but you can be sure it will. The key is to see the swell rising early so you can start paddling into position to catch the wave. We do it by looking for clues in the news, producing and attending conferences, and getting into great conversations with the RIGHT people. We encourage YOU to do the same. In the May Housing News Report, there’s an article about Amazon’s ongoing search for their second headquarters (HQ2). Even from just a real estate perspective, Amazon is a fascinating company to watch. There are SO many lessons to be gleaned from watching what they’re doing … and how the world is reacting. … and the 50,000 high-paying jobs (average salary = $100,000 per year) that come with it. We commented on this story at the time. At first, there were hundreds of cities in the hunt. We said at the time we think there’s an excellent chance Amazon will pick Atlanta. Early in 2018, the race narrowed to 20 finalists … and Atlanta’s still on the list. In the Housing News Report article, there’s a link to an analysis by Daren Blomquist of Attom Data Solutions. 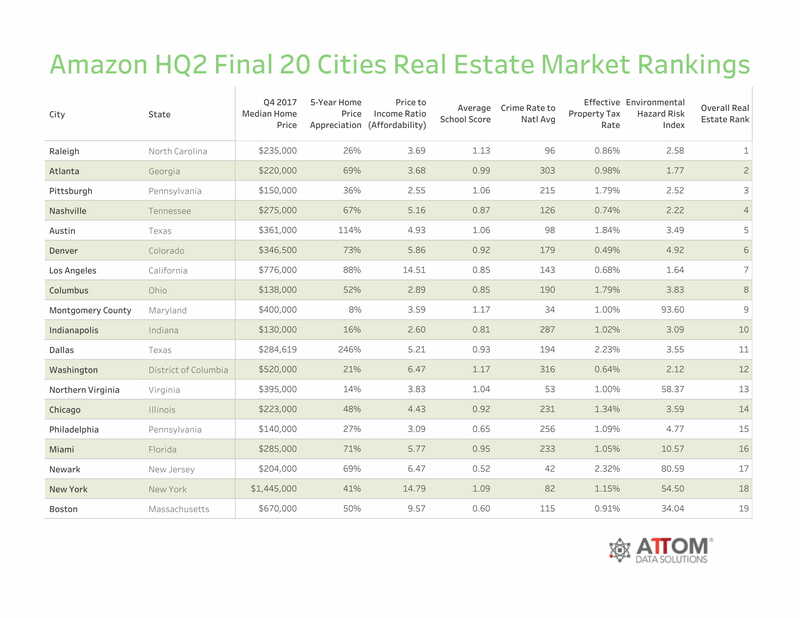 Daren ranked the 20 finalists by comparing the cities on certain criteria defined in Amazon’s original RFP. It’s the same process we did, except Daren used actual data … we just guessed. Notice Atlanta’s ranked #2. So our hunch is holding its own … so far. We’ve said it a thousand times, but just look at the median prices. They range from $130,000 in Indianapolis to $1.445 MILLION in New York. When people say, “Housing is in a bubble!” … what housing are they talking about? Indy? Seems pretty cheap based on median price and affordability. And when high-priced markets start hitting the top of their affordability range, people MOVE … to more affordable markets. People ALWAYS need a place to live. So while it’s true that migration patterns drive prices … demand rises or falls as people move in or out … it’s often economics that drive migration patterns. So an alert investor can get in front of growing demand and ride a wave up. That’s exactly what the folks who got into Dallas five years ago have done. Look at the disparity in five-year appreciation rates among these markets … from just 8% in Montgomery County to 246% in Dallas. HUGE difference! Even in markets where median prices are similar … say Dallas and Miami… the five-year appreciation variance is substantial … Dallas coming in at 246% and Miami at “only” 71%. So price doesn’t seem to be the deciding factor for appreciation. And neither does property tax … as Dallas is second highest behind New Jersey (hey, New Jersey had to win at something), but Dallas is still king of appreciation. Meanwhile Denver has the lowest property tax … half of Atlanta … yet their appreciation rates were about the same. And price-to-income ratios don’t seem to make the difference either … as Los Angeles and New York are both equally unaffordable, yet New York has half the appreciation. Obviously, this is just one chart … and it’s easy to get lost in the weeds. We don’t want paralysis from analysis. So charts like these are just the start of a deeper dive. What do winners have in common? Dallas and Austin are both triple-digit appreciators … even though Dallas grew at twice the rate of Austin. Is it just simply they’re both in Texas or is there more to the story? Prices get bid up when supply is growing more slowly than demand with capacity to pay. So though you can see affordability based on income on this chart, you can’t see supply and demand drivers. Neither can you see the economic drivers. But you need to look at them. That’s why we say you can’t study 20 markets well. It’s too much. Use a chart like this to pick your top three … and get to know them very well. What markets are poised for growth? Once you understand what makes a market like Dallas tick … and how it went from no growth to explosive growth … you can watch for similar factors in sleepy markets. When you spot something interesting, you go in for a closer look. If things go your way, you get there before the masses … and you get to catch a rising star! Big players can do research you can’t. But that’s okay because you can piggy-back on their hard work. It’s like cheating off the smart kid in school, except you don’t get detention. Amazon is a juggernaut in American business … and their power is impacting real estate of all kinds … retail, industrial, and even office and housing in markets where they have a footprint. That’s why SO much attention is being paid to their search for HQ2. But another reason to watch is they’re leaders in business decision making too. Other employers are watching what Amazon does and being influenced by it. So when Amazon ultimately picks a city, we’re guessing other companies will cheat off their homework … and pick the same city. The reason we bet on Atlanta is because many other Fortune 1000 companies had already chosen Atlanta as a great place to set up shop. We don’t know what process they went through to get there. We just know they did. So as Amazon goes through its process … they may reach similar conclusions. Of course, Raleigh is also home to a comparable number of big companies. But based on the world-class airport, huge labor pool, access to higher education, major distribution, and a business-friendly environment … though it’s close, we still think Atlanta has the edge. Then again, Jeff Bezos isn’t consulting with us, so we’ll just have to wait and see like everyone else. Meanwhile, as the field narrows, we’ll continue to learn where corporate leaders think the best location is for their businesses, employees, and new job creation. Hard to believe it’s nearly 10 years since Fannie Mae and Freddie Mac collapsed and were taken over by Uncle Sam. Time flies when you’re getting rich. It’s been a GREAT run for residential real estate investors … especially apartment investors. Free money in the punch bowl can really juice up a profit party. But after 10 years of equity happening to real estate bull market riders … it’s a good time to think about where we are, where things are headed, and what to do next. And looking forward comes in two parts: external and internal. The external is the world of variables outside your control. Like driving down the freeway, there are lots of other drivers whose actions affect YOUR safety and progress. But the key to your success isn’t what’s going externally. It’s how YOU navigate those external circumstances … based on what’s going on inside of you. It’s about financial and emotional intelligence. Because what you think and believe affects what you do … and what YOU do has the greatest impact on the results YOU experience. One of the biggest dangers of riding a wave of easy money into gobs of equity is thinking you’re an investing genius. We know … because it’s happened to us … and we see it happen all the time. It’s much harder to be humble, curious, teachable and innovative when you already think you’re smart. It’s important to know the difference between luck and skill. True financial genius is being able to make money when everything externally is falling apart … like a pro race car driver deftly navigating a multi-car melee at 180 miles an hour. That’s REAL skill. Anyone can rocket down an open road. Fannie Mae’s chief economist Doug Duncan told the audience at Future of Money and Wealth he thinks recession is likely in the not-too-distant future. And Doug made those comments after reminding everyone his last year’s Summit predictions were all essentially spot on. So based on both his pedigree and track record, Doug’s qualified to have an opinion. And we’re listening. The sun’s been shining on real estate investors for ten years now. Maybe you’re one of the many who’ve made tons of money. We hope that trend continues. But as our friend Brad “The Apartment King” Sumrok reminds us … it’s time to approach today’s market with a little more sobriety. Money and margins are both getting tighter. This means paying better attention to detail, increasing your financial education, and being careful not to rationalize marginal investments to bet on positive externals. In other words, beware of being a bubble market genius … and thinking what worked in a bull market will work when things change. Better to work on sharpening your skills at finding and creating value. Of course, real estate is FULL of pockets of opportunity … the polar opposite of a commodity or asset class where everything’s the same and moves together. Real estate’s quirkiness befuddles Wall Street investors … but thrills Main Street investors. On the one hand, lots of brand new inventory is coming on the market … and it’s putting pressure on landlords to offer profit reducing concessions. On the other hand, more affordable existing stock is attracting lots of interest… from both tenants and investors. So “housing” isn’t hot or cold. And neither are “apartments”. Real estate defies that kind of simplistic description. Of course, it takes financial education to recognize the difference between momentum and value. It also takes time, effort, and relationships to actually find the markets, team and properties to invest in. For most people, that’s way too much trouble. They’d rather sit in their crib with their trading app … or turn their financial future over to a paper asset advisor. That’s all peachy until rates rise, recession hits, and paper prices plunge. History … and Doug Duncan … says the inevitable bear market is getting closer. Of course, as we’ve previously commented … when paper investors get nervous, one of their favorite places to seek safety with return is real estate. So for active and aspiring syndicators … it really doesn’t get any better than right now. MILLIONS of baby-boomers are retiring. They need to invest for INCOME. … holding many TRILLIONS of wealth needing to (literally) find a home withreliable income and inflation protection. Their paper asset providers will try to meet the need, but their toolbox isn’t properly stocked. They can’t do private real estate. But as boomers struggle at squeezing spendable money out of sideways or stagnant stock markets, they’ll look towards dividends and interest. Cash flow. The challenge with dividend stocks is … in a volatile market, investors face capital loss on share prices. Worse, dividends can be cancelled. Compare this to rental real estate, which produces far MORE reliable income than dividends with LESS price volatility. And no one is cancelling the rent. So dividend stock investors would LOVE income property … IF it just wasn’t so darned hard to find, buy, and manage. Remember, a deposit is a LIABILITY to a bank. When you deposit money in the bank, the bank needs to create an offsetting ASSET … a loan. But the Fed has stuffed banks full of reserves … and there aren’t enough good borrowers to lend to. Banks don’t need to offer higher interest to attract deposits. So they don’t. Yes, it’s true bond yields are edging up, which means bond holders earn a little more income … but at a what price? Rising bond yields also mean falling bond values. So bond buyers are understandably very nervous about capital loss on their bonds. A bond default is TOTAL loss. Yikes. The relative safety and performance of income property or income producing mortgages secured by real estate is extremely attractive right now. The biggest problem for passive paper investors is real estate is hard to buy, messy to manage, and takes more financial education than just knowing how to click around an online trading app. And THAT is the BIG opportunity for skilled real estate investors to go bigger faster with syndication. Whether you decide to explore the opportunities in syndication or not … it’s important to stay curious, alert and proactive. Most real estate investors we know are preparing for the next recession … because that’s when true financial genius pays the biggest rewards. As a busy professional, chances are you’ve got people trying to bend your ear constantly about investment opportunities. And sure … some of them sound amazing, but how do you know you’re getting in with the right people? Or maybe real estate investing is what you want to do, but you don’t have the time for it. That’s where our guest Dr. Buck Joffrey found himself as a busy surgeon. Now, 10 years later, he’s killing it with a successful podcast and real estate syndication organization. This week, we’re talking about passive real estate investing … passing the heavy lifting to someone else while YOU get the return. Real estate is a messy, hands-on type of business. And while you can do all kinds of research beforehand, the best learning is on the job. If you don’t have time to manage your own deals, passive investing could be the right move for you. Passive investing gives you the benefits and returns of real estate … taxes, income, and diversification as well as the turn-key ease of setting and forgetting your investment. The appeal of real estate investments is partly because your assets are tangible. You can go visit your building, and it occupies more than just a piece of paper or line on a ledger. But, real estate takes time to understand the market, vet the deals, go through all the paperwork, and then manage a property afterward. You might be thinking, I don’t have time for that, I’m running my own business, and it’s taking all my time. Joining up with other investors is how to leverage the expertise of others and even tag along to become a student yourself, all while getting in quickly and easily. It really can be whatever you want to make it be for yourself! As a busy professional himself, Dr. Buck Joffrey discovered early on in his real estate investing journey that he wanted to find like-minded people to invest with. “If I got involved with a good syndicator who knew what they were doing, those returns and all those benefits I wanted out of real estate were there anyway,” Buck says. And, once he found people he knew, liked, and trusted in the real estate space, the hardest part was over. “What I realized is that if I could invest in such a way that if I did a lot of vetting and due diligence and I knew other people were involved … my chances of success went way up,” Buck says. It wasn’t long before Buck’s friends started asking what he was doing and how they could get in on it too. All of this relationship building is what Buck calls tribal investing. And this approach is key to his success. The relationship is just the building block to a good deal … Buck also notes that while there are lots of folks who he knows and likes, he may not be excited about the deals they’re doing. Just a little education about the types of investments you’re considering will go a long way. As with any investment, you need to know enough to ask the right questions so you don’t get burned. But, as a busy professional, adding in time for that education can be a heavy lift. That’s why Buck’s networking style translated perfectly into his new course, “Your Roadmap to Real Wealth.” It’s not just Buck teaching the course … he’s tapped into his deep network to bring in experts that share with you what he learned over a decade over a condensed timeline. Buck has gathered experts in real estate … INCLUDING yours truly, The Real Estate Guys™ as well as estate planners, and many, many more. We asked Buck about how passive investing works into the diversification angle. Buck mentioned he was initially interested in apartments as a first investment. Syndication gives you the opportunity to allocate your risk, and use your capital more efficiently. And all of that diversification collapses your time frame and gets you more cash flow sooner! To learn more about passive investing and Buck’s course, “Your Roadmap to Real Wealth,” send an email to roadmap@realestateguysradio.com. We’ll hook you up with all the details! Even though the Fed skipped a rate hike last meeting, someone forgot to tell the 10-year Treasury yield, which has broken over three-percent … DOUBLE where it was just two years ago. In case you don’t know, the 10-year Treasury yield is arguably the single most important interest rate on Earth … certainly for real estate investors. Of course, oil broke over $80 a barrel last week also … in spite of dollar strength. So while dollar-denominated gold dipped … oil rose. It makes us wonder what oil will do if (when) the dollar starts falling again! Now before you check out, let’s consider what all this means to Main Street real estate investors. Obviously, interest rates matter because most real estate investors are liberal users of mortgages. Higher rates mean higher payments and less net cash flow. But as we often point out, rising rates also affect your indebted tenants. Higher rates mean bigger payments on credit card, installment, and auto debt. And speaking of auto-debt, sub-prime auto loan defaults have spiked above 2008 levels. It seems consumers at the margin are starting to struggle. strongly supported by the oil industry … higher oil prices can be a GOOD thing. For everyone else, it means gas … and all petroleum derived products … andanything produced or transported with oil-derived energy … are all getting more expensive. And for your working class tenants … the cost of filling up their commuter cars is getting worse too. So until all this “wonderful” inflation makes its way into wages, working class people are still getting squeezed. All that to say, it’s probably a good idea to tread lightly on rental increases unless you’re very sure your tenants can handle it. In a recent post, we highlighted a SHOCKING proposal by the Chicago Fed to punish property owners by imposing an additional one-percent property tax … to pay for Illinois’ severely under-funded pension plan. Of course, Illinois isn’t only the place with pension problems, so be on the lookout for a punitive tax proposal coming soon to a neighborhood near you. This is why we continually point out it’s REALLY important understand the markets you’re in. YOU might be hyper-responsible, but if the HOA’s in trouble … you could be too, because they have the the power to assess YOU to pay for it. As we pointed out at Future of Money and Wealth, governments sometimes do desperately dumb things when they’re facing financial challenges. The latest case in point comes to us from the super-city of Seattle … home of Amazon, Starbucks, Boeing and several other mega-employers. You may have heard, the city council of Seattle voted 9-0 to impose a “head tax” on all businesses doing over $20 million in GROSS revenue. The original tax proposed was over $500 per person. But after businesses complained, they backed off to “only” about $275 per head. The purported purpose of the tax is helping the homeless, which is a noble cause. But regardless of how you or we feel about it, what matters is how the employers feel … and they’re NOT happy. “ ‘We are disappointed by today’s city council decision to introduce a tax on jobs,’ [Amazon Vice President Drew Herdener] said in a statement. These are two pre-eminent brands and major economic drivers for Seattle and its surrounding neighborhoods … and there are 298 other big businesses also affected. While they’re not likely to all pack their bags and move out in the middle of the night, Amazon’s comments make it clear they’re also not committed to staying or growing. … what matters is how employers feel and what they choose to do when slapped with taxes or regulations. Because if these companies go in search of a friendlier environment, one area will lose current and future jobs … and others will gain them. As real estate investors, we want to be on the right end of that shift. That’s why we’re always watching for clues in the news. There are many ways to invest … and one way isn’t necessarily better than the other. Real estate is nuanced. It’s always a good idea to broaden and expand your expertise into different markets. That’s why we’re THRILLED to talk to our returning guest, Tom Wilson, about commercial real estate investing. His engineer’s mind can deconstruct this intimidating topic into bite-sized pieces … the perfect size for inspiration! Commercial real estate investing feels more advanced because the deals are bigger. But the truth is that it takes nearly the same amount time to learn how to do big and small deals well. One of the beauties of commercial deals is that you’ll get more leverage. And, this will put you on the road to adding commas to your thinking and diversifying your real estate knowledge … a must in dealing with a changing market! Of course it takes time to get educated on a new market. Many commercial real estate deals are funded through syndication. Jumpstart your education by joining forces with people who know their stuff. Since Tom has a background in engineering, he approaches problems from a research and numbers perspective. But even he knows the value of bringing in the experts. 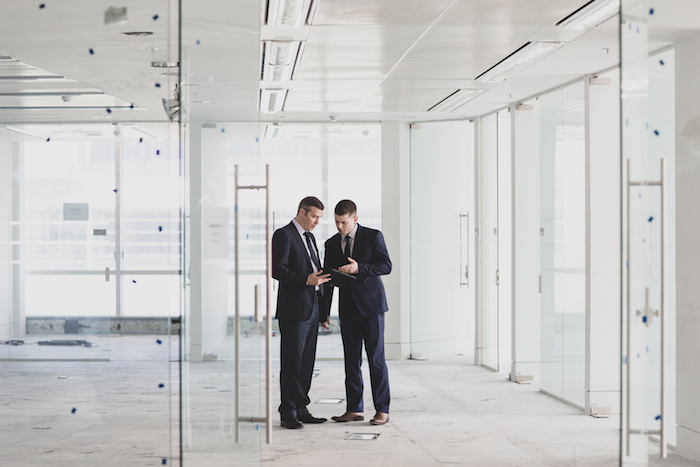 One of the things that can initially seem foreign to new commercial real estate investors is what tenants look like in a commercial building. Leases are longer for commercial deals. It’s not uncommon to see a commercial lease for 15 years or longer on a single-tenant building. You know that businesses are going to stick around in one location for a long time. Maintenance is handled by the tenants. These leases are called triple-net leases, which essentially means that the tenants pay all real estate taxes, building insurance, and maintenance. “Many of us who have had rental properties understand about turnover, tenants skipping overnight, having to do evictions. These elements are rare in the commercial arena,” Tom says. With the right expertise, managing commercial can be much easier. The tenants are higher-quality, and you have lower turnover in your buildings. And, you’ll likely know well in advance before a vacancy happens. When you’re looking for a commercial space, you need to know who your tenants are. This is even more crucial when you have a single-tenant space. “It’s important to do a deep dive into the tenant’s financials and the market they’re in,” Tom says. With big-name brands, remember that there may be low risk, but there’s also low returns. However, the tier below that offers a real opportunity for some good deals, as long as you’ve done your homework. Just like there’s diversity in the types of residential properties, the options for commercial real estate are just as rich. And, e-commerce has definitely caused a bit of a shift in the commercial real estate space. Not only that, but the increase in demand for these industrial distribution locations have removed some of the supply for other commercial properties, which means the market for industrial and commercial real estate is healthy. We also know that brick and mortar stores aren’t going away. You can’t get your hair or nails done online. You still drop off and pick up your dry cleaning, and your pets go to the vet! And, commercial real estate doesn’t stop at brick and mortar stores or even distribution centers. Large manufacturing plants, refrigeration, R&D, and many other options are out there for types of commercial real estate. Get educated enough to ask tough questions. Surround yourself with people who know more than you do and don’t feel intimidated. Delegate and spread out responsibility so each person has a manageable piece to take on. Stay rational when the stakes are high. If you’re ready to take on commercial real estate, Tom has prepared a special report packed with important details on how to be successful in this niche. To get your free copy, email us at commercial@realestateguysradio.com. You may have heard that it’s bad to mix business with pleasure. But, when it comes to lifestyle investing, part of the fun is owning property in a place you love. Yes, it is possible to make lifestyle investing make sense for you … as long as you follow some important guidelines to line up the numbers, location, and opportunity. Life is too short to be involved in an asset class you don’t enjoy. Too many times in real estate, we get hung up on the ROI and let it rule the day. Lifestyle investing spices things up by adding personal enjoyment and personal use into the mix. With the right strategy, you can tap into a FANTASTIC opportunity for growth. Premium properties fetch a premium price from renters and vacationers. Of course, you’ll also be able to enjoy the property with your family and friends. We’ve all been on vacation and experienced that “I never want to leave” feeling. But remember, just because a place is nice to visit doesn’t mean it makes sense from an investment point of view. Here are a few recommendations to keep in mind. As with any real estate investment, your research into the market will be worth its weight in gold. This is especially true for lifestyle investing where the durability of rent, the ability to fill occupancy, and the property’s long-term profitability will be the difference between a fun investment and a bust. With a good location, property, and market your investment has the opportunity to weather downturns. People in higher income brackets can afford to go on vacation even if the economy is down. 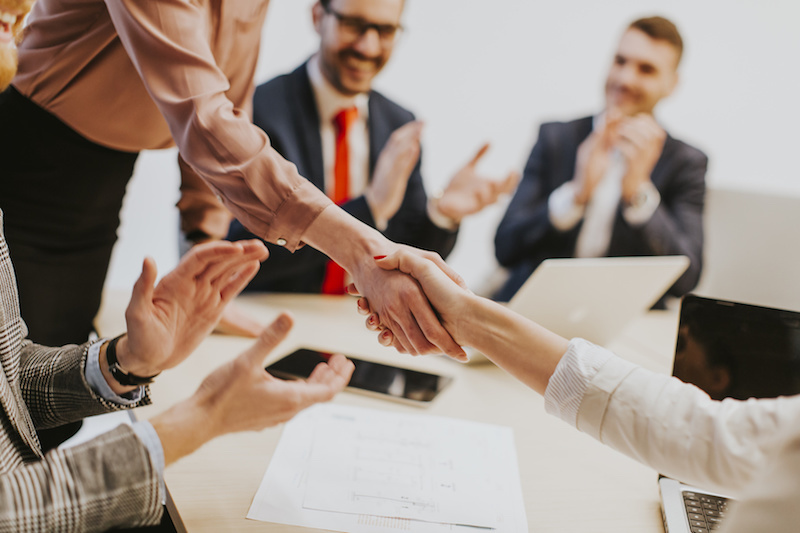 The difference between a fun, hands-off lifestyle investment that you’ll love visiting and a drag is a good management team. 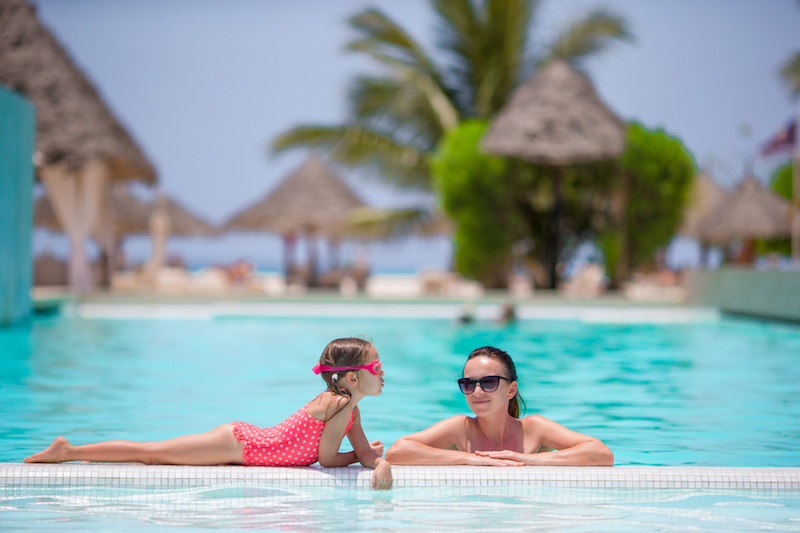 Property management comes at a higher cost than single-family homes … sometimes upwards of 50 percent … but it gives you peace of mind AND access to amenities that delight and excite high-end vacationers and renters. Your management team will handle all the bookings, and they have access to wholesale outlets such as Travelocity, Hotwire, Priceline … all the big names people use to get their vacation rentals. And bonus! When things break, they fix them. Orlando, Florida, is the #1 traveled to place in the world. Thanks to Disney World, Universal Studios, and a THRIVING convention market, there’s no end of things to do for business travelers and families. And did we mention it’s a no income tax state? Nobody knows this better than Nick Rohrbach, our guest from The Grove Resort and Spa. Plus, unlike many destinations, Orlando is not seasonal. The average occupancy is about 75 percent year round. Even during the economic recession in 2009, average occupancy never fell below 60 percent. All of these elements make Orlando a place you might want to keep your eye on. When you’re looking for a lifestyle investment, one of the important questions you need to answer is how a particular property sets itself apart from competitors. Florida’s economy is one of the reasons The Grove is such a unique opportunity. Rohrbach explains that the project was originally built in 2007, 2008, and 2009, and all the units were sold to UK investors without closing on a transaction. While all the units were structurally built, only 184 condos were completed. With some additional cash, amenities, and building out the insides, these units are essentially brand new. Amazing amenities including restaurants, 800 sq. ft. of convention space, and a newly opened water park. Spacious condos with 2-3 bedrooms perfect for families. Close proximity to Disney World … only 3 miles away! For potential investors and owners, there are plenty of opportunities as well. The Grove has a stellar management company that keeps the property looking fantastic, takes care of you and any guests, and manages all the bookings, repairs, and maintenance. Not only that, but The Grove is continuing to expand, with 878 total units coming online at completion. Only 450 rooms are available now, and they’re at 100 percent occupancy! As demand goes up, so will rates … and cash flow from a potential investment. Lifestyle investing can sound like a dream come true, but it still has to make financial sense for you. Look at a market that appeals to you personally, and then start running some numbers. For instance, syndication might be the right way to go. You could get creative and discover investment opportunities in a few locations so you’ll have access to a bunch of prime vacation spots. Blurring the line between a pure ROI, detached investment and something you get to enjoy too doesn’t have to be out of reach. If the numbers, market, and property make sense, don’t be afraid to go for it! Want to know more about turnkey lifestyle in Orlando, Florida, and things to avoid in the marketplace? Send an email to lifestyle@realestateguysradio.com. We’ll hook you up with a special report with all the details.